They are getting so big and fluffy now! They are all in their final instar, might be getting ready to pupate soon. I think they might use wood in some way to help construct their cocoon, so I have them in a big jar with soft wood and leaves. Hopefully they find the situation suitable. 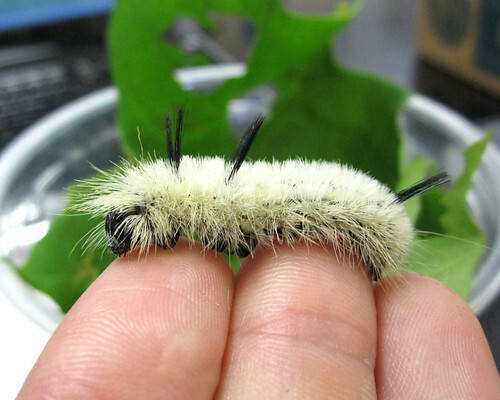 And speaking of growing up… my Acronicta oblinita babies are looking quite handsome. This morning I found one of them had constructed a cocoon out of the willow leaves in their container – awesome! Waiting on the rest to follow suit. 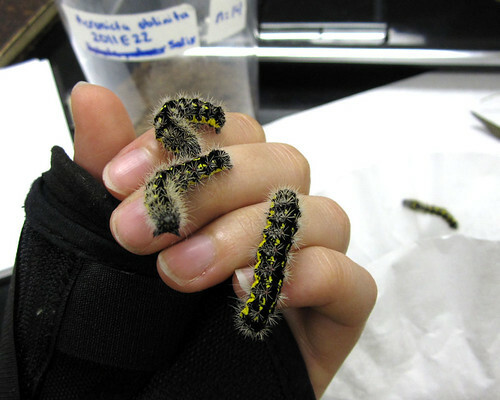 My rearing efforts are getting more scattered – some caterpillars are big and need minimal attention, some are newly hatched and need measurements every day, I have some eggs waiting to hatch, and some adult females who will hopefully oviposit for me. I have a handful of eggs from an A. haesitata my advisor caught for me, a few are started to develop spots (normal for many Acronicta eggs, means they are developing properly), so that’s exciting. One A. hasta I collected laid three eggs for me last night, I wonder if she’ll give up any more? I really want to rear that species! Several of the females are so fat they look about to burst, so they’ve got to have eggs… I will give them more sugar water and perhaps set some up in the oviposition chambers I created. Oh! And a few A. afflicta eggs hatched the other day, and 6 babies are getting settled in on oak, happily skeletonizing the leaves and thrashing their heads when I get too close. I am doing everything I can to ensure the virus (which hit my last batch of A. afflicta) does not reach them. Rearing them individually now, so that should help. Keeping my fingers crossed. There’s always something exciting happening here. Well, exciting to me, at least. Posted on June 28, 2011, in Acronicta, Acronictinae, Invertebrates, Lepidoptera, Noctuidae. Bookmark the permalink. 3 Comments. oh we love them! we love them all! Why do you think it was a virus that got them? Besides separating them, what are you doing with the new ones to prevent it from happening again? It was some sort of sickness that spread through the lots, probably by me using the same forceps/brushes to deal with them. It had characteristic symptoms – bodily discoloration, watery frass, wild wiggling of the prolegs and inability to grip, slowing of feeding. It hit a few closely related species. I’m going to keep them individually but otherwise it would be crazy time consuming to disinfect everything between uses… so… we’ll see. Disinfecting all the used containers at least.